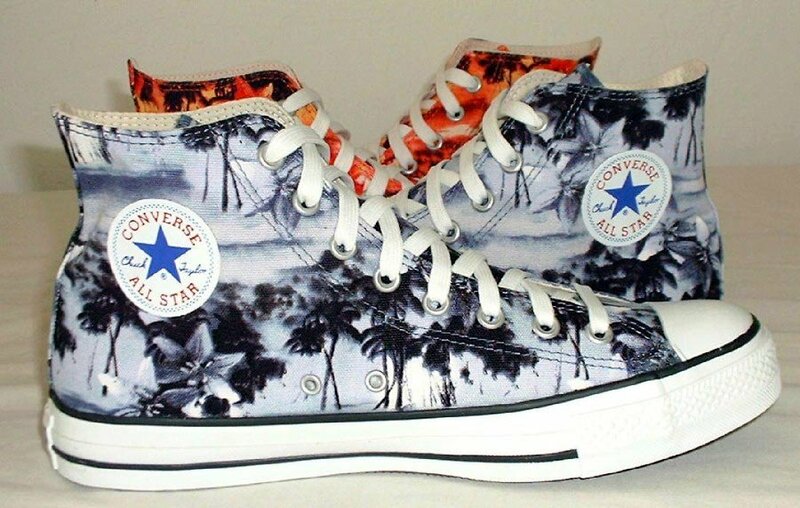 Photo gallery of chucks with tropical and nautical print uppers. 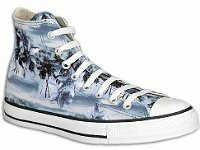 1 Tropical and Nautical Pattern Chucks Blue Hawaiian high top, right outside view. 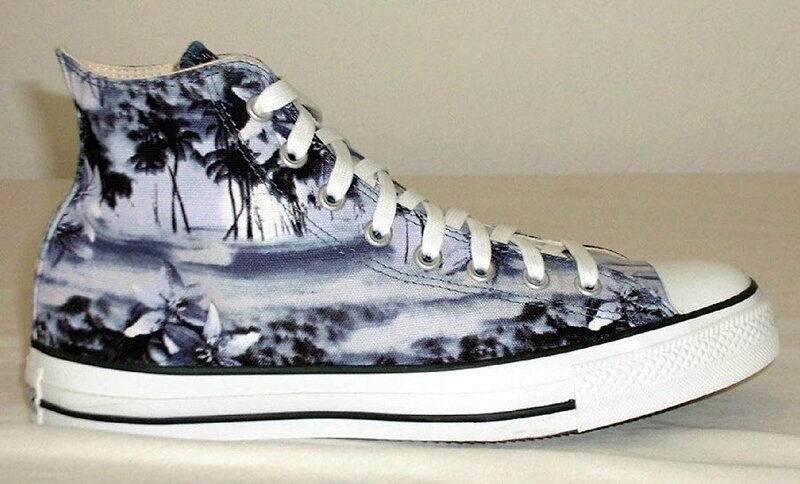 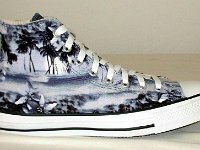 2 Tropical and Nautical Pattern Chucks Left Blue Hawaiian high top, outside view. 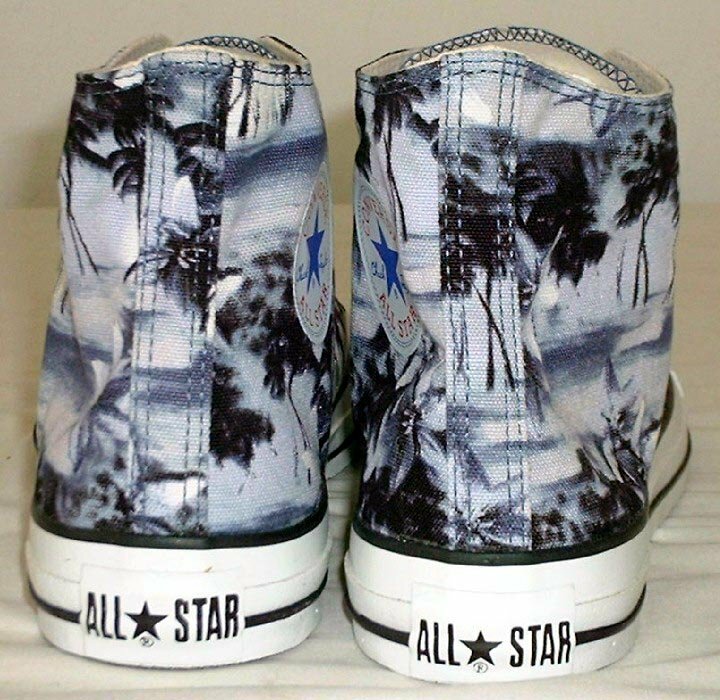 3 Tropical and Nautical Pattern Chucks Left Blue Hawaiian high top, inside patch view. 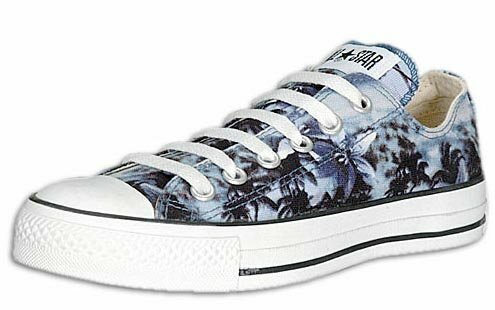 4 Tropical and Nautical Pattern Chucks Right Blue Hawaiian high top, outside view. 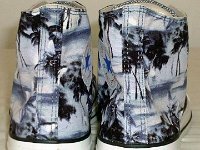 5 Tropical and Nautical Pattern Chucks Right Blue Hawaiian high top, inside patch view. 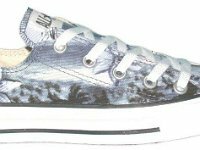 6 Tropical and Nautical Pattern Chucks Blue Hawaiian high tops, inside patch and sole views. 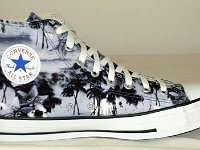 7 Tropical and Nautical Pattern Chucks Blue Hawaiian high tops, front view. 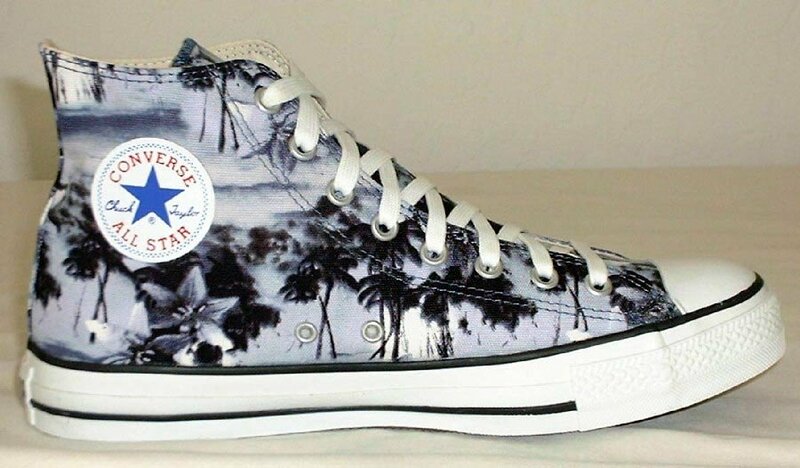 8 Tropical and Nautical Pattern Chucks Blue Hawaiian high tops, rear view. 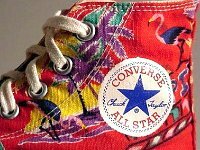 9 Tropical and Nautical Pattern Chucks Blue Hawaiian high tops, closeup of rear heel patch. 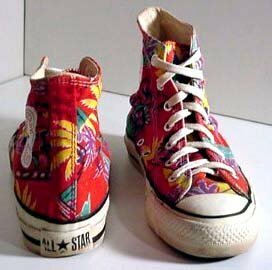 10 Tropical and Nautical Pattern Chucks Blue Hawaiian high tops, side view in front of a pair of Orange Hawaiian high tops. 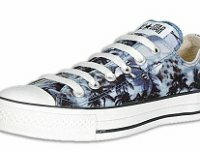 11 Tropical and Nautical Pattern Chucks Blue Hawaiian low cut, angled side view. 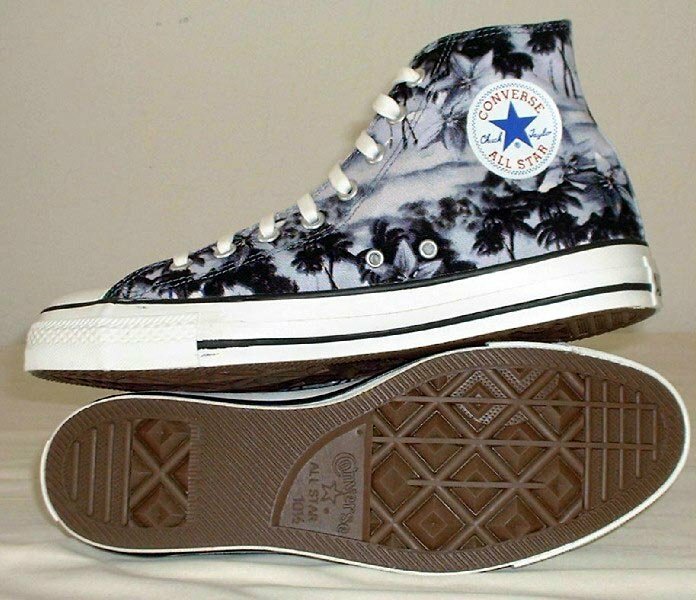 12 Tropical and Nautical Pattern Chucks Side view of a Blue Hawaiian low cut. 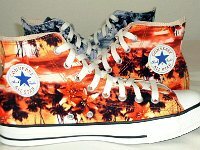 13 Tropical and Nautical Pattern Chucks Brand new Green Hawaiian high tops, inside patch views. 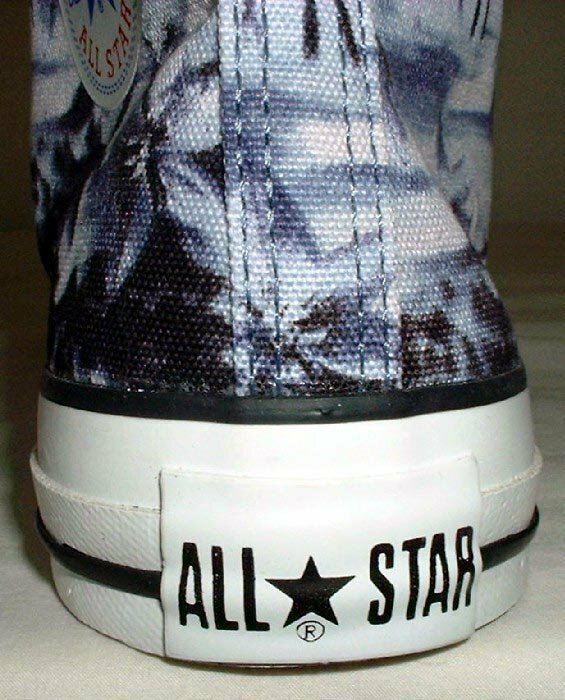 14 Tropical and Nautical Pattern Chucks Inside patch view of a left green wave pattern high top. 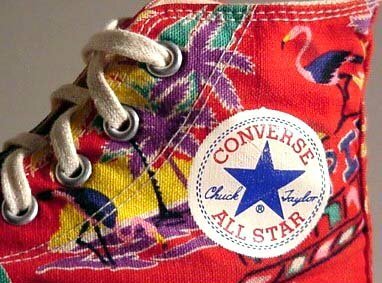 15 Tropical and Nautical Pattern Chucks Wheel of Blue and Orange Hawaiian high tops, inside patch views. 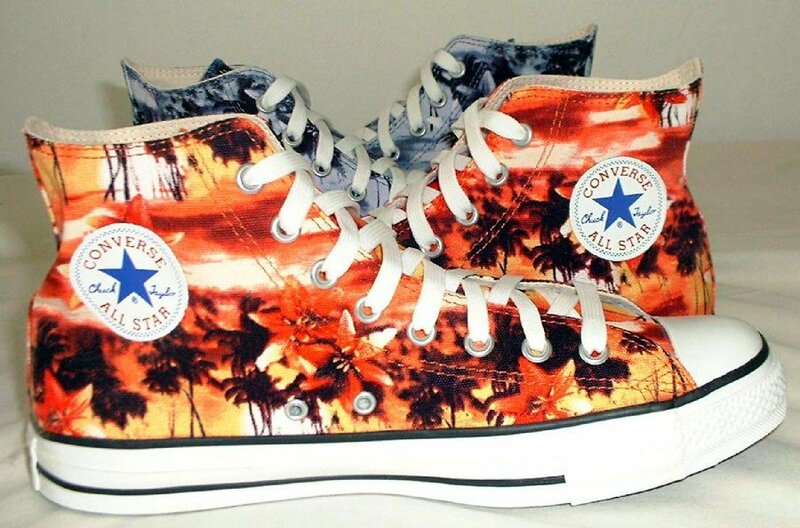 16 Tropical and Nautical Pattern Chucks Outside view of Blue and Orange Hawaiian high tops. 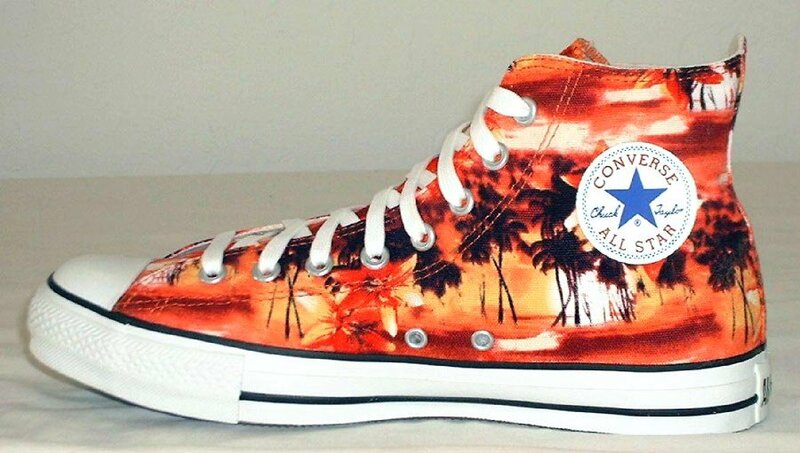 17 Tropical and Nautical Pattern Chucks Right Orange Hawaiian high top, outside view. 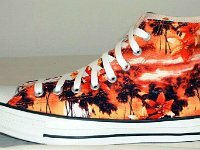 18 Tropical and Nautical Pattern Chucks Left Orange Hawaiian high top, inside patch view. 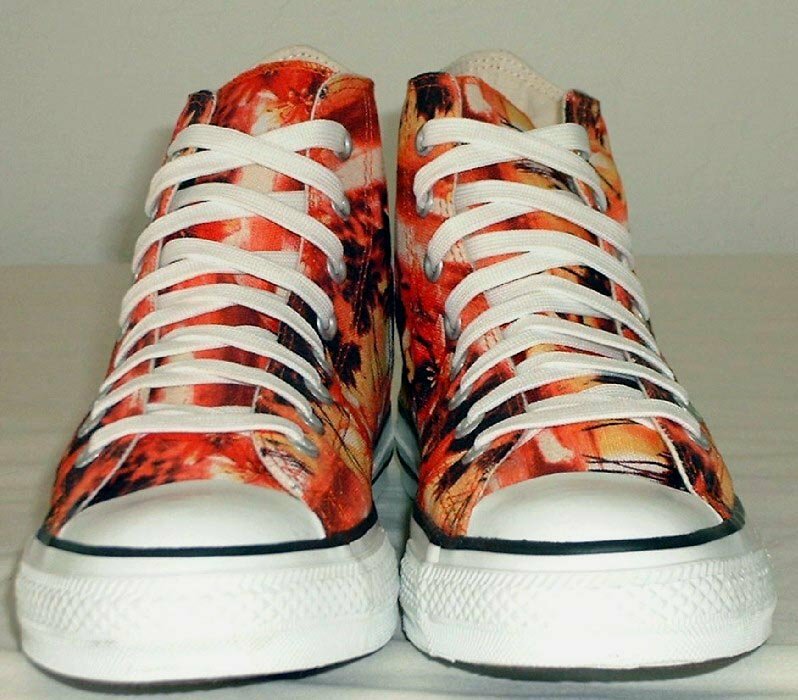 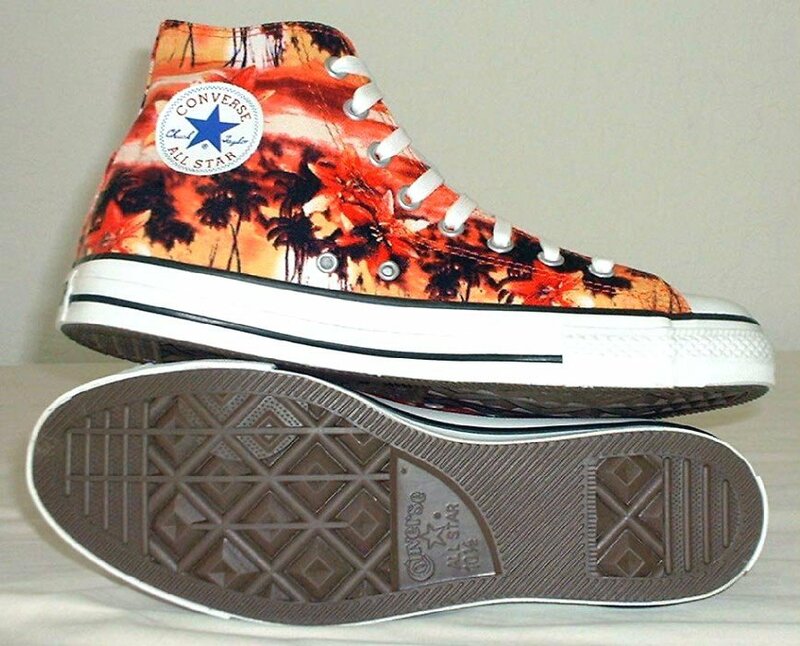 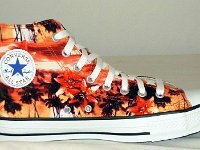 19 Tropical and Nautical Pattern Chucks Left Orange Hawaiian high top, outside print view. 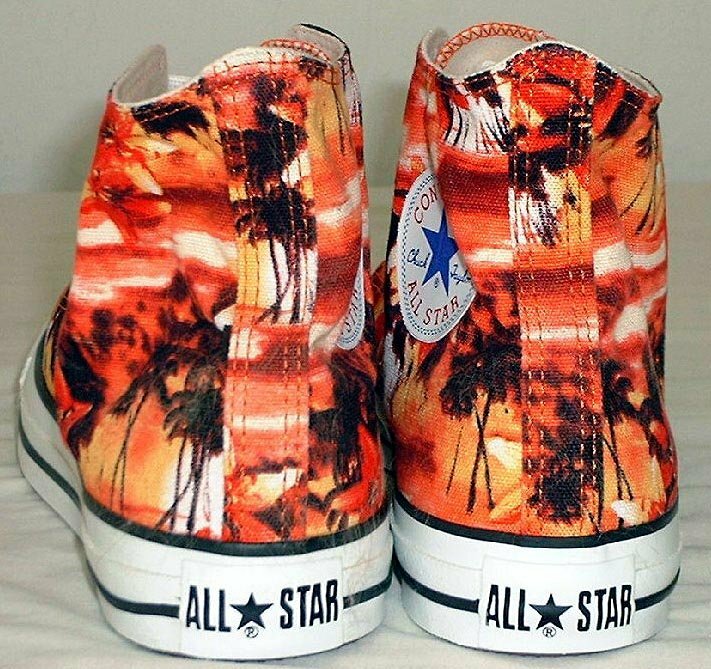 20 Tropical and Nautical Pattern Chucks Right Orange Hawaiian high top, inside patch view. 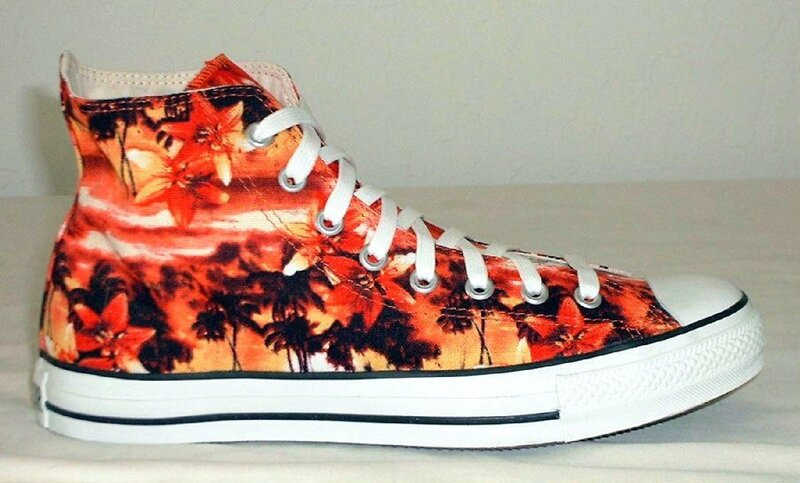 21 Tropical and Nautical Pattern Chucks Right Orange Hawaiian high top, outside print view. 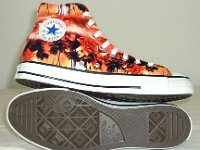 22 Tropical and Nautical Pattern Chucks Orange Hawaiian high tops, inside patch and sole views. 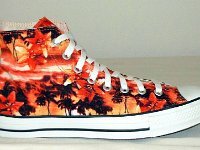 23 Tropical and Nautical Pattern Chucks Orange Hawaiian high tops, front view. 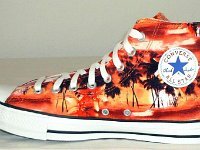 24 Tropical and Nautical Pattern Chucks Orange Hawaiian high tops, rear view. 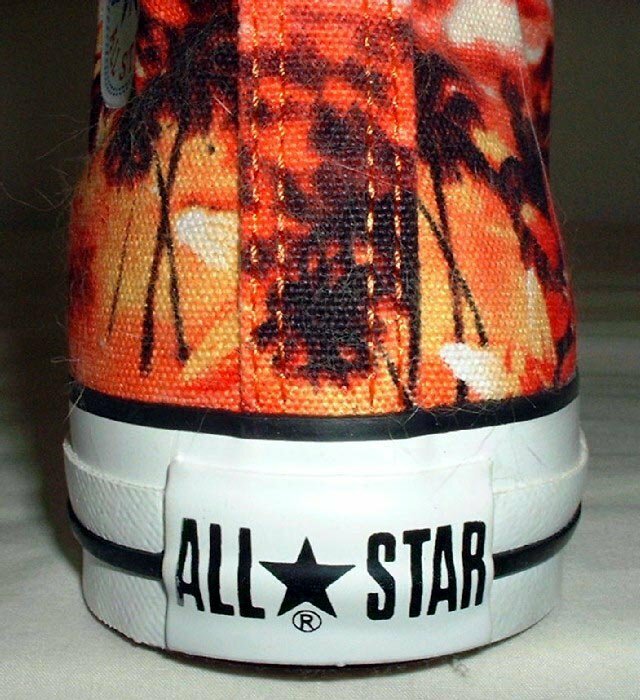 25 Tropical and Nautical Pattern Chucks Orange Hawaiian high top, close up of the rear heel patch. 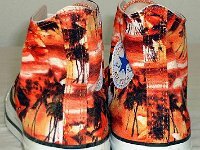 26 Tropical and Nautical Pattern Chucks Orange and Blue Hawaiian high tops, inside patch view. 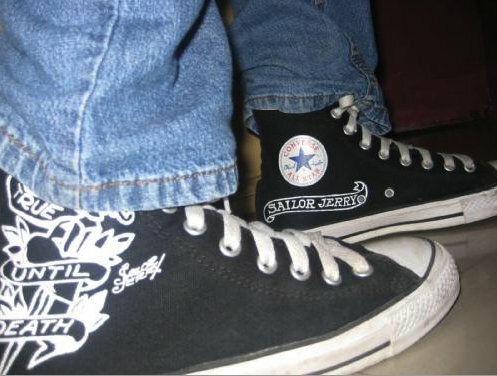 27 Tropical and Nautical Pattern Chucks Angled side view of black Sailor Jerry high tops. 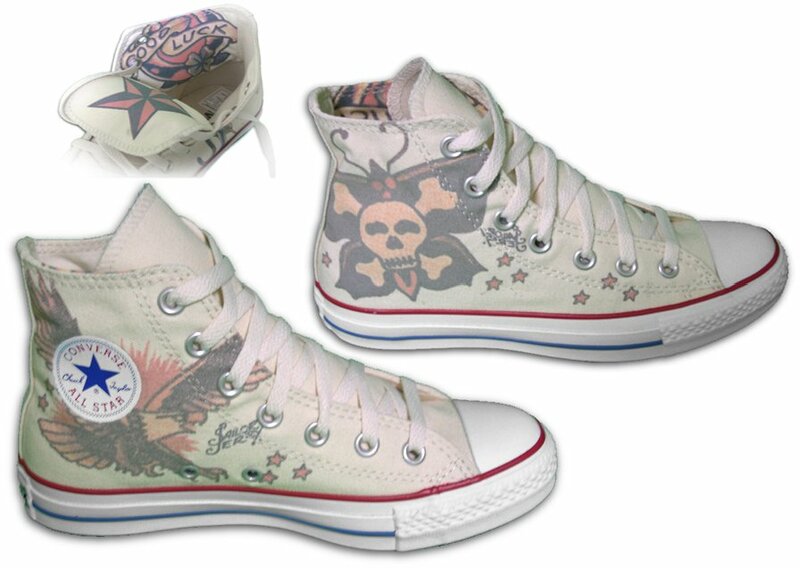 28 Tropical and Nautical Pattern Chucks Side view of Dead End Sailor Jerry high tops. 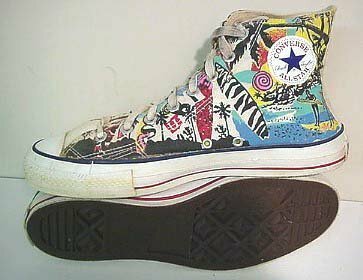 29 Tropical and Nautical Pattern Chucks Side view of white Sailor Jerry high tops. 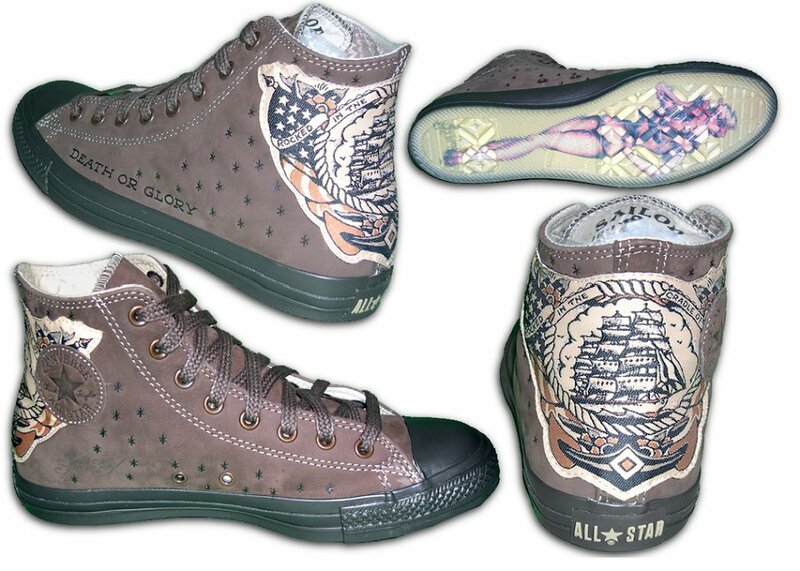 30 Tropical and Nautical Pattern Chucks Multiple views of green leather Sailor Jerry high tops. 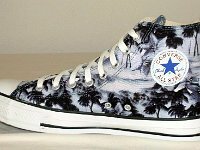 31 Tropical and Nautical Pattern Chucks Wearing black Sailor Jerry high tops. 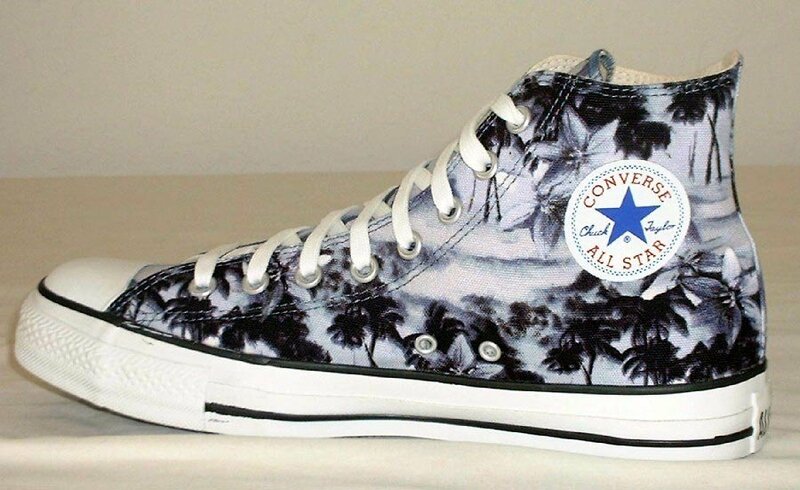 32 Tropical and Nautical Pattern Chucks Wearing black Sailor Jerry high tops. 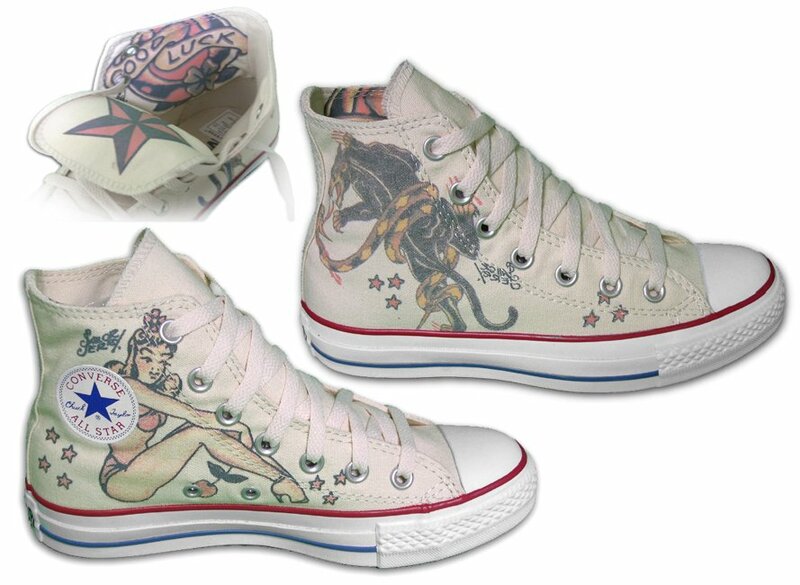 33 Tropical and Nautical Pattern Chucks Side views of white Sailor Jerry high tops. 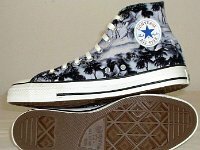 34 Tropical and Nautical Pattern Chucks Angled side views of black Sailor Jerry high tops. 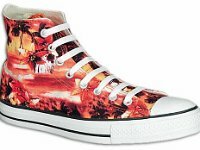 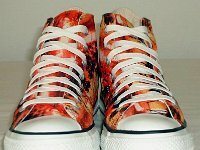 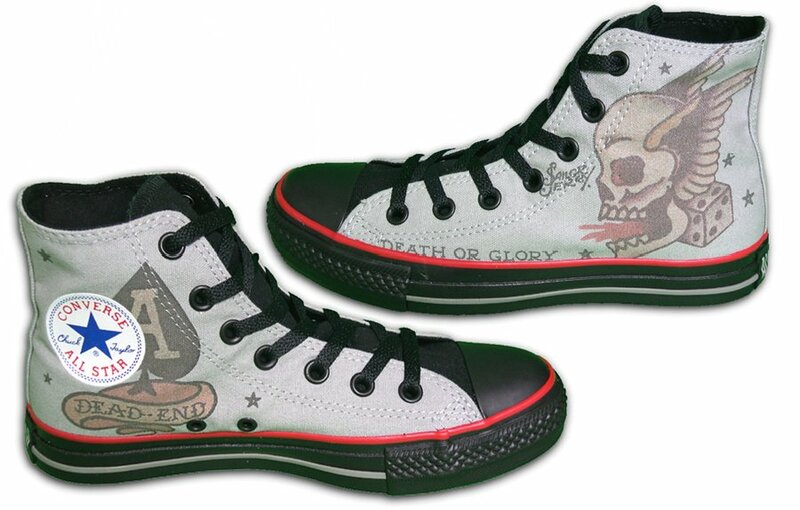 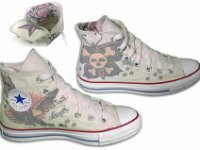 35 Tropical and Nautical Pattern Chucks Multiple views of Death or Glory brown leather high tops. 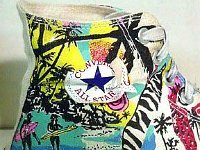 36 Tropical and Nautical Pattern Chucks Surfer print high tops, inside patch and sole views. 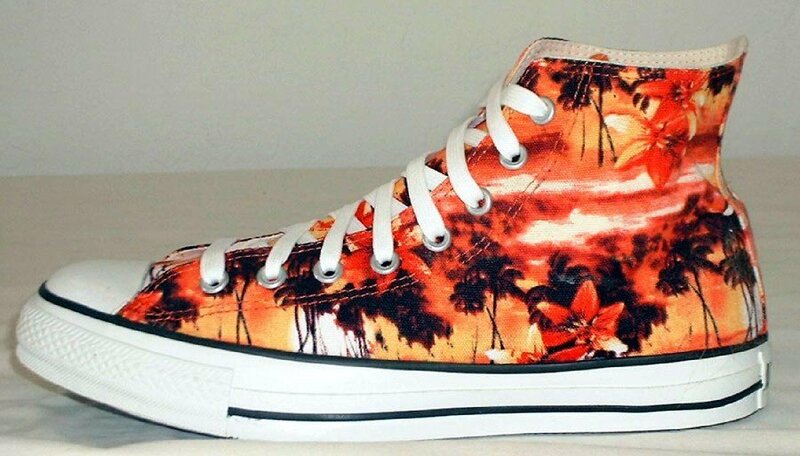 37 Tropical and Nautical Pattern Chucks Left surfer print high top, with torn inside patch. 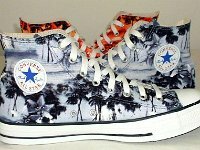 38 Tropical and Nautical Pattern Chucks Surfer print high tops, front and rear views. 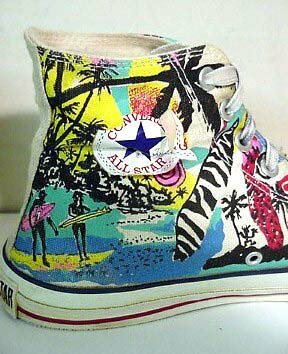 39 Tropical and Nautical Pattern Chucks Surfer print high tops, front view. 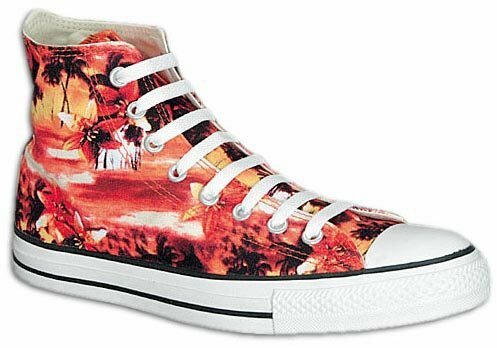 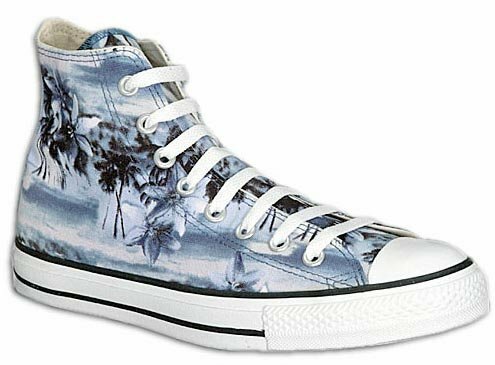 40 Tropical and Nautical Pattern Chucks Tropical print high tops, angled side views. 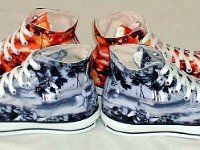 41 Tropical and Nautical Pattern Chucks Tropical print high tops, front and rear views. 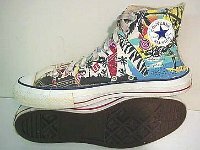 42 Tropical and Nautical Pattern Chucks Tropical print high tops, inside patch and sole views. 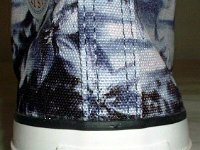 43 Tropical and Nautical Pattern Chucks Closeup of a right tropical print high top, showing the pattern and inside patch. 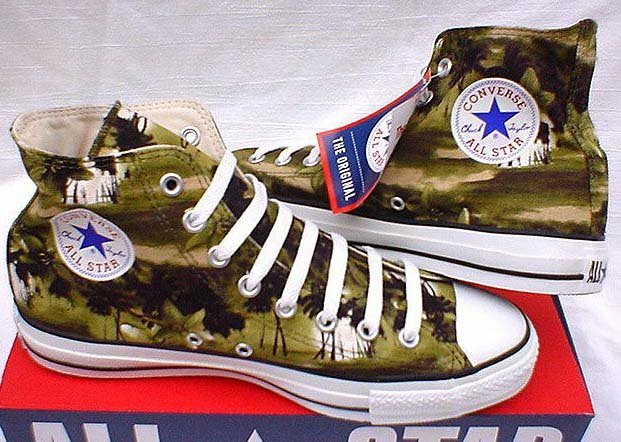 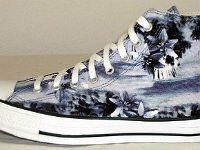 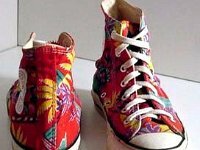 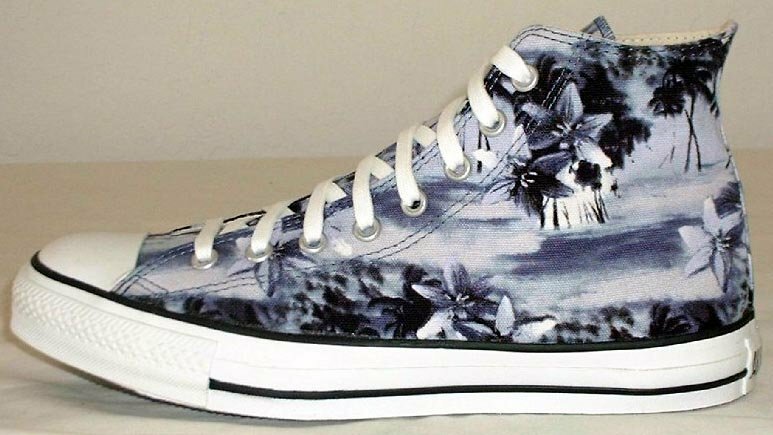 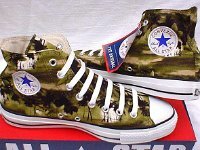 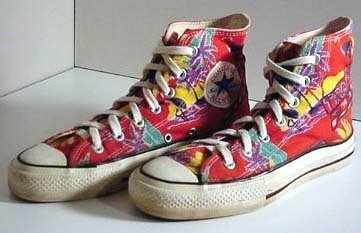 Since Converse started marketing Chuck Taylors as a casual shoe, many seasonal models have been produced with different canvas fabric patterns and prints. 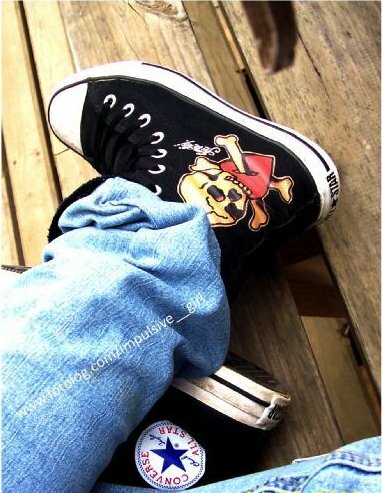 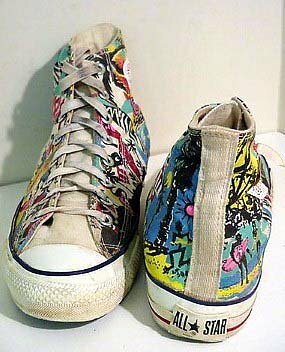 The canvas uppers of chucks have been used for commercial tie-ins to films, events, businesses, sports teams, and bands, printed with all kinds of Converse Chuck Taylor logo patterns, come in geometric designs, or issued with seasonal themes. 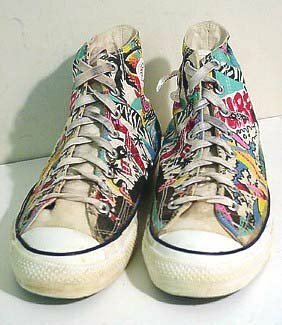 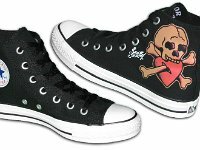 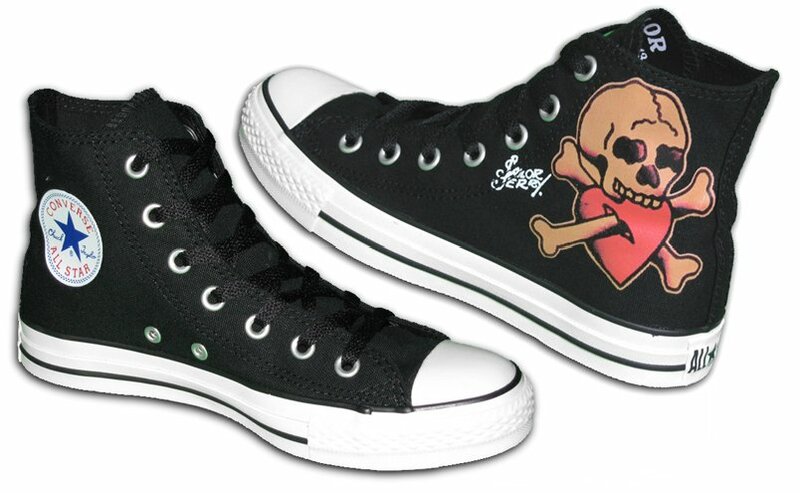 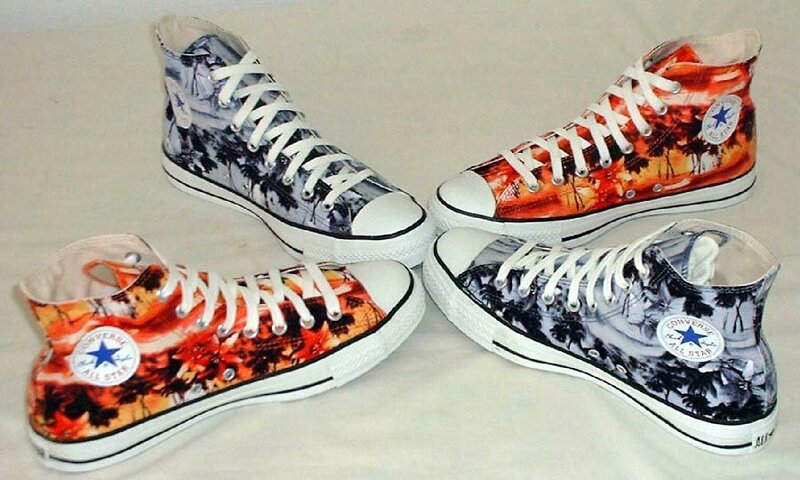 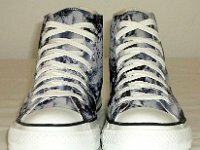 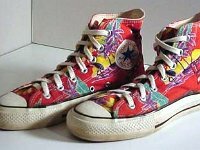 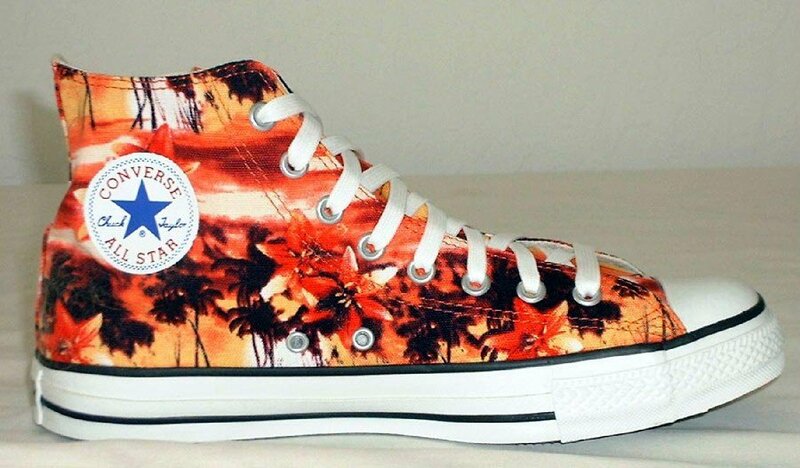 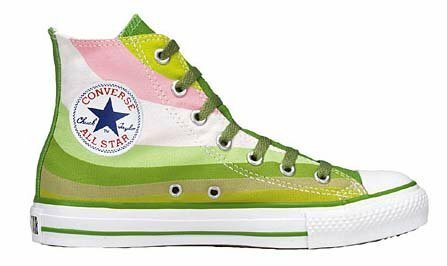 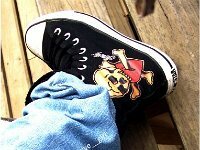 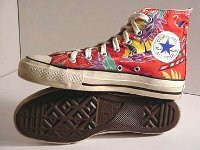 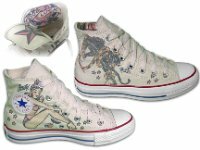 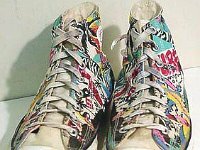 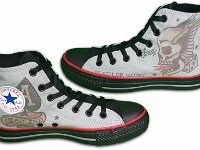 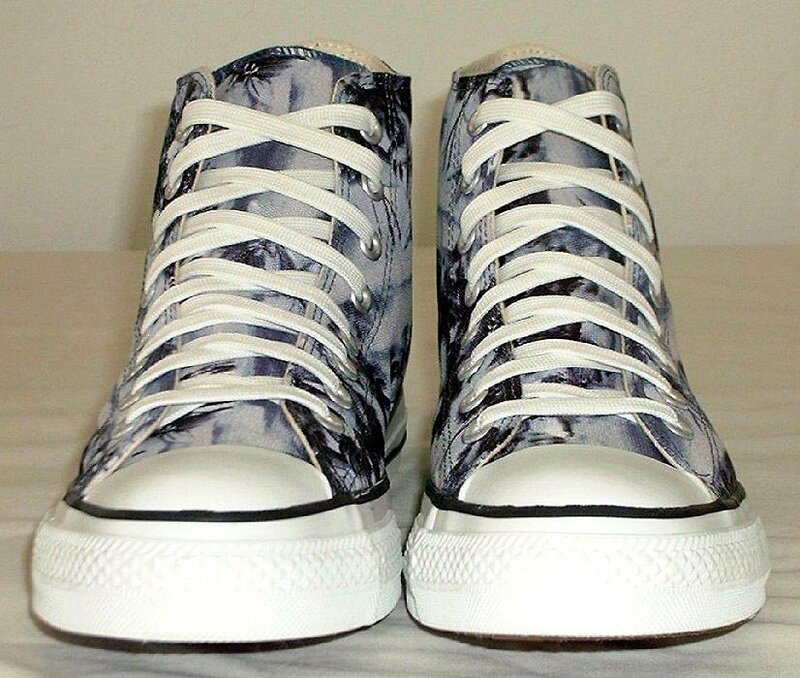 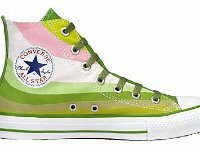 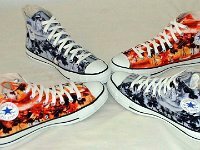 Many people have taken basic core model chucks and used the canvas uppers for custom painted designs or for tie dye models. 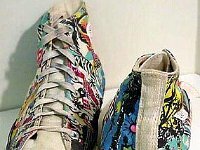 A good selection of these prints are shown in these seven galleries, while flag, camouflage, stencil, tattoo, the artwork of Laurie Lyden, and Christmas holiday patterns are shown in their own galleries.